The Smith and Wesson 638 Airweight J frame revolver appears to be my answer to a dilemma that many people who desire to go armed all the time face. That of a gun that can be carried effectively when wearing dress clothes. You know, the slacks, button up shirt tucked neatly in, working in an office.......that kind of dress. In clothes like this almost no gun will go well just stowed in a pocket. Even a “pocket” gun will feel like a boat anchor in your pocket dressed in wool slacks. Add to that the fact that I will probably never be comfortable with a Kel-Tec or even one of the new Ruger LCPs. I had to find something light enough, powerful enough and small enough to go with me anywhere. The Smith and Wesson 638 Airweight revolver has filled that need. I settled on the gun while looking at a Gun Shop in Fort Smith. I had been searching for the ultimate concealed carry gun (you know that one we all eternally search for). And, like everybody else, I didn't find it. But I did find what I think will allow me to fill out my “unarmed” times which occur due to clothing issues. 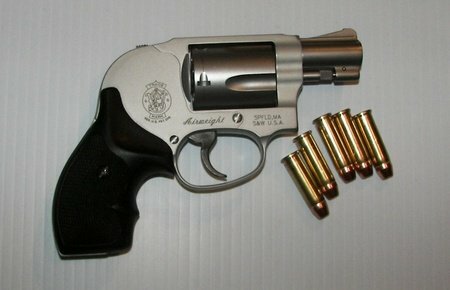 The Smith and Wesson 638. When I took the diminutive .38 special revolver out of the gun case and felt the surprisingly light weight, I knew I was holding a handful of possibilities. The first one I checked out was the exposed hammer model that fit my hand like a good glove. I checked out the cylinder, dry fired it a few times then put it back. Then I checked out the Smith and Wesson 638 with hammer shroud and knew I had found my solution. While the hammer shroud adds a little weight, it is not significant and the snag free design enhances what it is made for ....concealed carry. 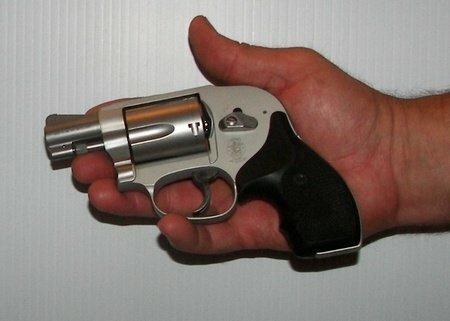 When I considered the inherent reliability of a revolver, and the potential power of the .38 special +p (which these revolvers are rated for), I put down my money and left with the gun. I took out the Smith and Wesson 638 Airweight revolver in my van and put it in my jeans pocket just to see what it felt like. I ended up carrying it around like that for the rest of the day. And it was in my pocket that I took it to the Old Fort Gun Club river range with a fresh box of .38 special reloads that I had just made a few nights before. I only took 50 rounds, just to get used to the gun, not really expecting the range session to be particularly enjoyable with a revolver this size. I just wanted to be able to hit an 8x11 sheet of paper at a few yards for my practical concealed carry concerns. Well, by the time I had loaded the cylinder 10 times, I wished that I had brought 500 rounds instead of just 50. The little .38 special revolver was as much fun and satisfying to shoot as any gun I have held in my hand. I couldn't believe the lack of felt recoil with the reloaded rounds in this tiny revolver. And the ability to hit the target with the little gun was more than a little surprising. I don't need to look any further for the load to shoot in the new Smith and Wesson 638 revolver. The hand loaded rounds have 4.4 grains of Hodgdon Titegroup powder behind a 125 grain Hornady XTP JHP bullet, with CCI small pistol primer. This load sends the 125 grain bullet downrange at over 900 feet per second, providing sufficient power for civilian carry needs. And with this load, the gun is completely controllable and pleasant to shoot. I fired the gun at 7, 15, 36, and 50 feet, alternately shooting pretty quickly for combat fire practice and slower to see what I could get out of the gun. Because I didn't have much ammo, I didn't do any very slow fire or rested fire to wring out the last bit of accuracy from the gun. But, it didn't matter. For the purpose that I bought the Smith and Wesson 638 revolver, I was quite confident with what I had down when I left the range. Below are a few of the distance and target results of my brief firing session. 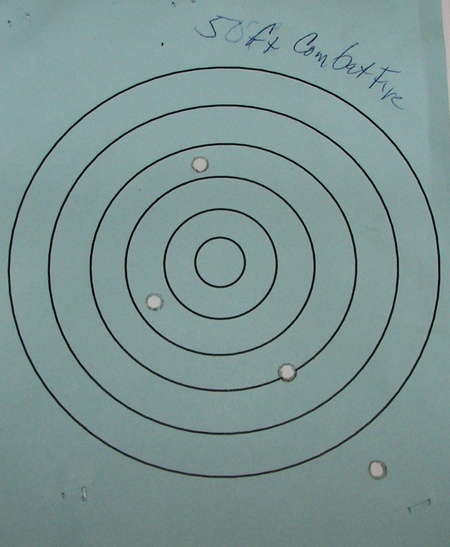 Since the gun is a five shot revolver, I shot in groups of five. 15 ft fast combat firing (note the flyer down below the target). 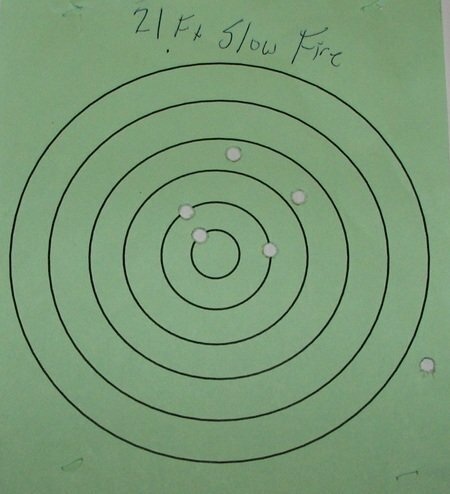 21 feet slow fire (sights aligned, slow, steady fire) the extra hole to the right is from where the paper overlapped another target. 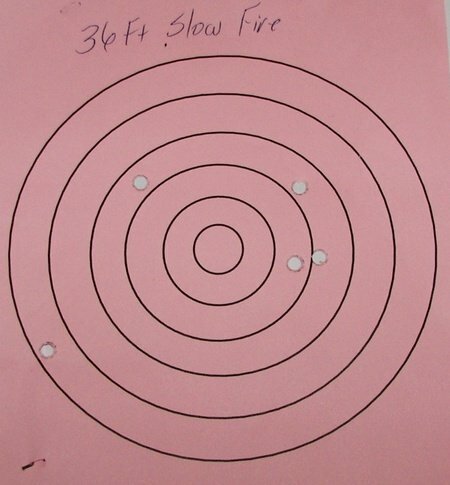 36 feet slow fire (sights aligned, slow, steady fire). 50 feet combat firing (sights aligned shooting rapidly). 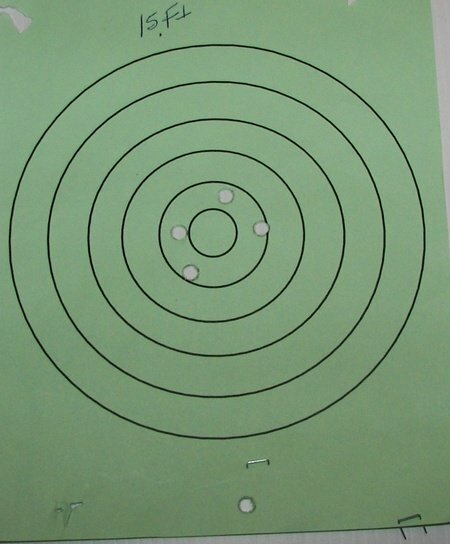 One off the paper, one off the target, 3 center mass. It got pretty tough to shoot quickly with accuracy at this range but it still put 3 in the effective zone for self defense. 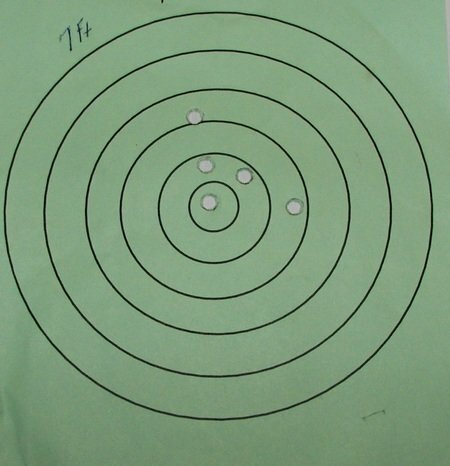 Because I had limited ammo, I never settled down and concentrated on accuracy shooting or from a rest. 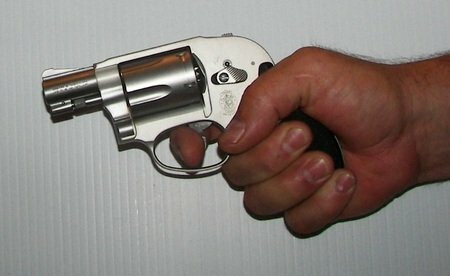 But from the results I got with this revolver with just a 1 7/8 inch barrel, I expect it to be impressive for what it is. The specs for the little Smith and Wesson 638 Airweight .38 special revolver are as follows: Model: 638; Caliber: .38+P; Capacity: 5 Rounds; Barrel Length: 1 7/8"; Front Sight: Integral Front; Rear Sight: Fixed; Grip: Rubber Grips; Frame: Small - Bodyguard Style; Finish: Matte; Overall Length: 6 3/8"; Material: Aluminum Alloy; Weight Empty: 15 oz. 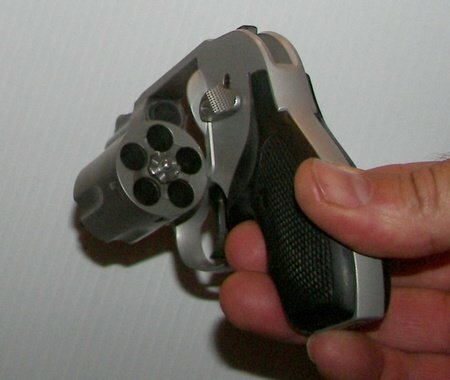 The only real improvement that could be made to the ability to control this J Frame revolver would be a set of rubber Hogue Grips. 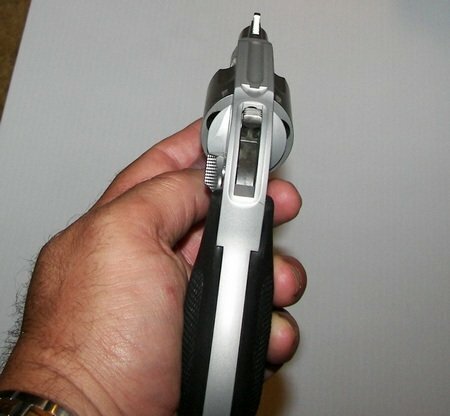 This would make the gun considerably more manageable when pulling the trigger (and more comfortable to shoot). The MSRP on the guns is around $560 but the real world price on them is around $425-$450. Mine was $429.95 + tax new at my local gun shop. The Smith and Wesson 638 goes in any small gun pouch and can be carried in jeans, coat or jacket pocket easily. For my daily dress, I have a Fobus Ankle Holster that I carry the gun in often, and have for 3 years now (updated statement). The holster takes some getting used to, but it's now like part of my leg. My biggest challenge is not forgetting I have it on. How well will the gun hold up over the long haul? That remains to be seen, but the guns have been around for quite a while now, and reports on them remain positive. And these are not range guns made to live through thousands of rounds shot in torture fashion. They are guns that are made for limited practice and to defend your life if the time comes. If I can just resist the urge to shoot it till it melts, I imagine the gun will give me a long time doing what it does best. Allowing me to go armed 100% of the time. 3/12/2012: The Airweight revolver has been with me now for almost 4 years. For the size of the gun and the ability to carry a pretty effective round, the gun was one of the best buys in the last few years. 4/2013: The Airweight still with me, still going strong. 7/2014:I took the little gun out this month along on a shooting venture with several other handguns. Like always, it shoots like a champ. 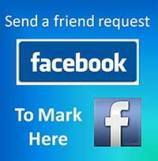 Tough, dependable, easy to hide, quick to access. Few guns have stayed with me long term. This one may be with me the rest of my life. UPDATE 2018: This line of Smith and Wesson revolvers has flourished for quite a few years now. Called by different names, and specified for use by model name, they are still the same size and configured in familiar ways. Fully exposed hammer; exposed, but shroud protected hammer, fully shrouded hammer (double action only available). These guns, designated J-Frame have been, and remain some of the most popular concealed carry revolvers in the U.S.